Because of her amazing performance in 'A Star Is Born', Lady Gaga is a nominee this evening(January 27th) at the 25th Screen Actors Guild Awards at the Shrine Auditorium and Expo Hall in LA. 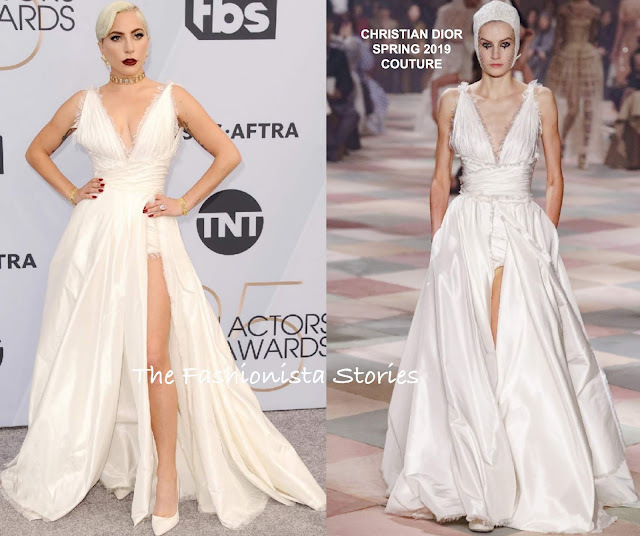 The CHRISTIAN DIOR SPRING 2019 COUTURE collection just debut on the runways last week and Gaga is giving it the first run on the carpet. Her white taffeta gown featured frayed edges with a deep v-neckline, side pockets and a split revealing matching shorts. The runway gown was styled perfectly with a swim inspired, fishnet cap which I think Gaga could have pulled off if she wore it. However I love her vampy lip and gold jewelry. But if I had to nitpick, I would switch the pumps for ankle strap pumps or sandals. What do you think of Gaga's look?